Who says you need to spend oodles of money to smell like a goddess in the shower? 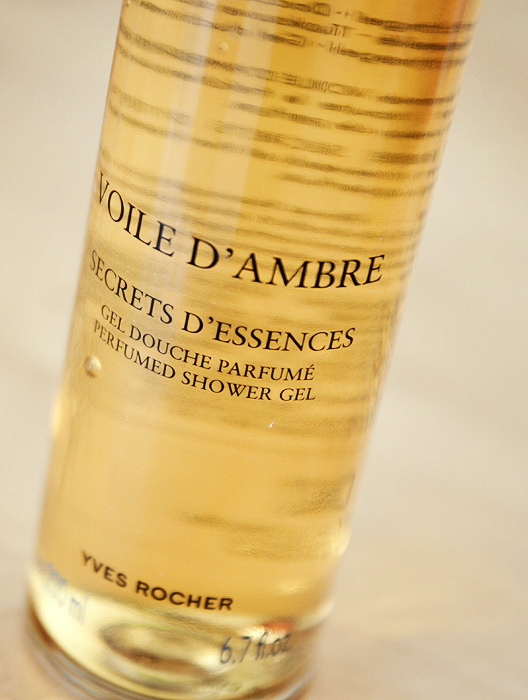 Yves Rocher’s Voile d’Ambre Shower Gel defies its (current) sub-£10 price tag and smells more like one of the department store fragrance flankers. At £7-odd, I don’t use this daily… but it’s perfect for layering under your favourite oriental, woody perfumes and is a great scent choice for ushering in the colder weather. I’m not going to review it like it’s a perfume… it’s a shower gel after all, and I can only hold a certain amount of excitement for shower gels regardless of how nice they are, but still… the amber in Voile d’Ambre isn’t overpowering but lasts beautifully on my skin. I’m keen to explore the other shower gels, and perhaps even the perfumes in the Yves Rocher line – I’m glad I added this one to my recent order, it’s so nice to find a new brand (to me) to get my teeth stuck into! Yves Rocher Voile d’Ambre Shower Gel is currently priced at £7.80 and is available to buy online in the UK from the Yves Rocher website. But their ‘proper’ perfumes are fabulous and get some rave reviews. I used to have an Yves Rocher shop in the town I lived in and I went in and tried everything several times and they really do have some gems. They have classic perfumes in the usual range of fresh/floral/oriental. They also do some corking soliflores like mimosa and peony in the desir de nature range. But The Secrets D’Essences range is fantastic – it’s kind of their hidden secret weapon. They take a popular ingredient or note like rose, amber, iris, jasmine or vanilla and they construct a modern fragrance that showcases it. I love their amber and their rose – it’s so clear and simple, it’s my favourite rose. And I wear the amber all the time. Try the deodorants! Hmm, well it depends what you want to wear your deodorant with. If you want to wear it on its own, then you can choose any of them – the scents are pretty strong, so I wear the one I have as a body spray without anything else. I’ve got Neonatura Souffle – it’s a very fresh scent – the one in the pale bottle (Called Nature fills me with inspiration on the UK website) and I do like it. The other Neonatura in the dark bottle I know as Cocoon but on the UK site it’s called ‘Nature gives me its strength’ – that one is chocolatey and got great reviews in the forums (yes, I’m really really geeky about this and no, I’m not proud). It’s not my cup of tea because chocolate in perfume is a big turn-off for me, but if you like Musc Maori (Parfumerie Generale) this is a pretty good bet. Though I will not accept any blame if a hungry toddler tries to eat you. With the Secrets line, I’d go for whatever you fancy playing up in your perfume – you can amp up one angle of something with your deo or you could wear them alone. 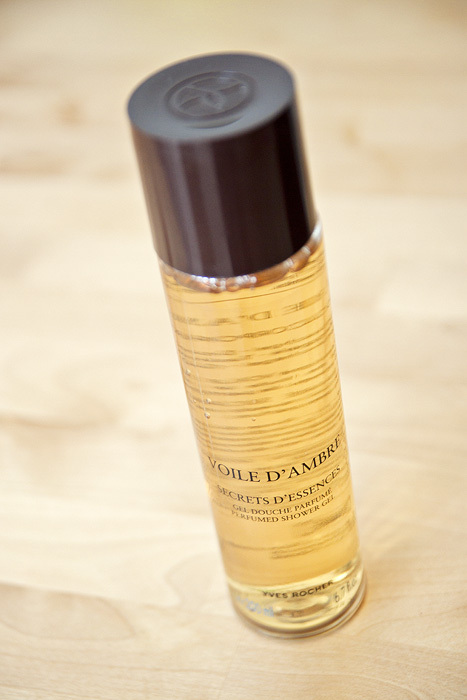 Obviously the Voile d’Ambre is a great scent, as you already like it in the shower gel. The Rose is a very straight, fresh rose; the Jasmin is good quality and not skanky (I remember trying it against Bulgari’s Mon Jasmin and it holds up) and the Iris Noir is ladylike and not sweet or too powdery; the vanilla is a rich, dark one if I remember rightly (haven’t got a sample of that to hand). I bought a bunch of the Secrets d’Essences in little minis when they came out and they’re good value. And looking on the Yves Rocher website, some of the little purse sprays of the perfumes are actually cheaper than the deodorants, so you might as well take the plunge. They are very much eau de parfum strength – a little goes a long way – and they last all day. I find them pretty powerful and spray with care. They’ve got some nice eaux de cologne in their Fraicheur de Beaute range too – personally I liked their Cedar, but I don’t know how you feel about pencil shavings? As for the Terry split – boo! But maybe there will be another one?